This car has a tree coming out of the back seat and items growing on the side of the car... Someone must be caring for them because they are green and still growing unlike the trees with the bottles on them. I know that there is some kind of history here but I have not found it out. But a very cool sight it is. On our way to Virginia City Saturday we passed a road side stop and got out. At first it looked like just another scenic view but as we stood there I noticed structures so we took a walk down to these. We really do not know what this place was and were not able to find out much yet but the small bit I did find I added at the end. Virginia City is a really fun place to visit. It is a tourist destination for many and the events are varied but always fun. Like Camel Races the second weekend of September and over Labor Day will be Civil War Days. I just love going there to see the way they lived during the "Gold Rush" days. There is a stage coach ride I want to take and also a "Mine Tour" that goes under ground that sounds like a lot of fun. I took the train ride a few years ago with my daughter and loved it especially spending time with her then. Today was spent with my son, we had a mission to find a sign but we were unsuccessful so we decided to spend the day there. Crock pots are so easy to use, the food comes out great because it is cooked slowly and there is very little effort used in the prep and cooking. 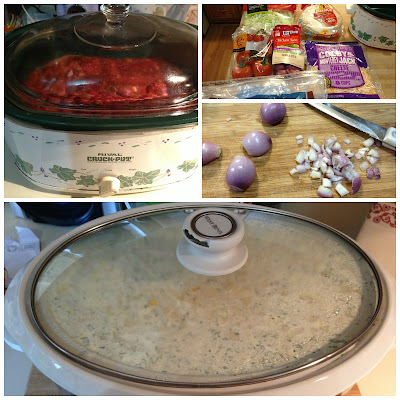 It had been a couple of years since I had used my crock pot until my sweet and fun fellow blogger (Whom is a great blogger you should check out her blog) got one for herself and her excitement sent me out again looking for easy but tasty recipes. So I called my Auntie and asked her to share some crock pot recipes with me and then an idea sparked in my mind... I told her if she sent me her recipes I would put them into a cook book along with all her great memories that she had from the days she used them. Have you ever used Bear Creek products They are the best as far as dried products go. The flavor is rich and very tasty. It's not like eating processed food when reconstituted, its like eating real home made food cooked from scratch. So it was my obvious choice when I wanted to make a crock pot meal and whip it up quick. I used the soup mix as a base and added boneless skinless chicken, potatoes, corn and onion then just set the heat on high for eight hours. Here is the end product... Not much like soup I guess I added too much of everything but it was delicious and a great dish for a large family to gather and share. Good food, laughter and love is best shared over great food. This ones a keeper.